Carrie Mae Weems’ photographic projects are unique and distinguishable for their narrative quality. 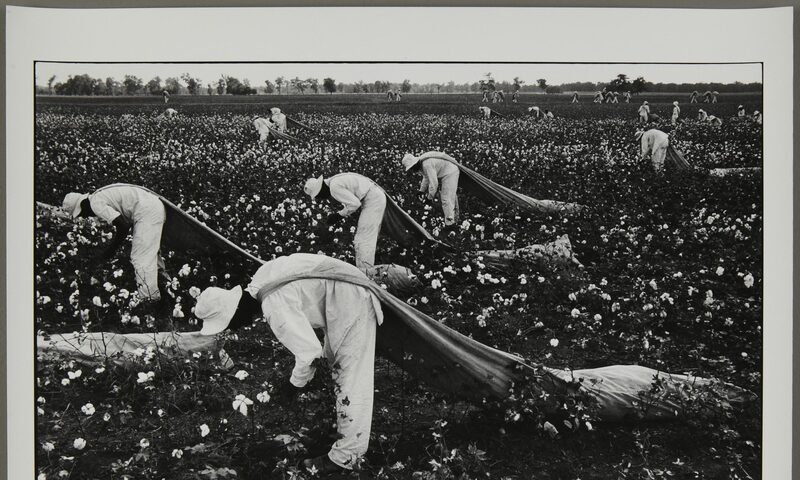 In her series, From Here I Saw What Happened And I Cried, Weems creates a visual history of black subjugation using images from the archives of several museums and universities. 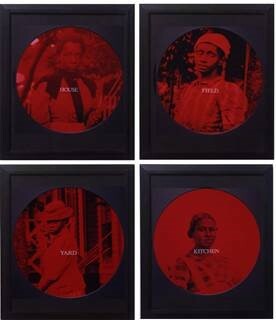 With this set of red, chromogenic photographs, Weems demonstrates the ease with which black identities have historically been defined and upheld by others. The identities and histories of most of the subjects in Weems’ series are unknown. Weems alters each photograph to emphasize this ambiguity. Over each photo, Weems places a monochromic, red filter. This has obscures much of the background in each image, with the bottom right photograph (“Kitchen”) being completely erased in red. Additionally, all four images have been enlarged and cropped to show only the top half of the figures, focusing our attention on the facial expressions of each woman while hiding much of the surrounding environment from view. The identities of each woman may be unknown but this does not stop Weems, or anyone of us, from assigning them one. Each photograph is labeled, visibly marked by the sand-blasted text across each frame. In combination with the concealed effect of the red filters and cropped images, these seemingly “floating” plantation roles feel all the more imposed. Enclosed by a black border, the final appearance of these four portraits shares a striking resemblance to the lens of a camera, or given the effect of enlarged images, the lens of a microscope. This microscopic “lens” Weems positions over each woman further enforces her message about the invasive and commonly oversimplified nature of the identities assigned to black individuals.